Kanye West and Donald Trump have a lunch date at the White House tomorrow along with senior adviser Jared Kushner. West apparently wants to discuss criminal justice reform and job scarcity in Chicago. Before that, though, the rapper and streetwear magnate will be present for the Music Modernization Act signing ceremony. According to Billboard, Kid Rock will be joining them too. What a trio! West previously met with Trump in late 2016 after the election. 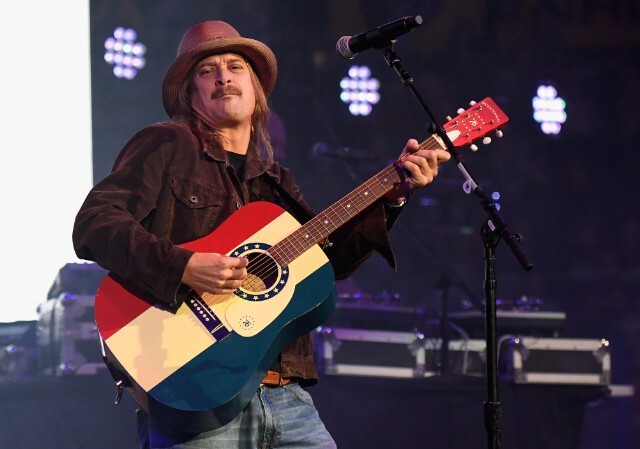 Kid Rock visited Trump in the White House with Ted Nugent during the president’s first 100 days in office. The Trump-supporting musicians will witness the signing of the Music Modernization Act (MMA), which aims to improve and streamline royalty payments for artists. Last month, the Senate unanimously passed the MMA. The House Of Representatives then unanimously approved the updated version of the bill and sent it to the president’s desk. Recording Academy President and CEO Neil Portnow and Recording Industry Association Of America President Mitch Glazier will also be in attendance, among others. The signing is scheduled for 11:45 AM EST.